The world-leading manufacturer of guitar effects pedals and musical effect systems has positioned themselves for rapid growth by turning to Open Source Integrators for their expertise in adopting USA Odoo, an Open ERP system that provided data integration for their production, accounting, purchasing, inventory, and sales. They now have the freedom and flexibility needed to support their unique operations. The client is a top producer of guitar effects pedals and other musical effects systems, and their products are known as the best in the industry, used in the professional and amateur musician markets worldwide. The client’s goals were simple – to build products with no compromises. They wanted to push the limits of technology in music, and redefine what was possible with music gear. They wanted to use exceptionally great components and ridiculously powerful processors. They wanted to make gear that sounded better than anything anyone has ever heard, and make their customers happy and inspired to create amazing music. The client’s products are designed and manufactured in the US, 100 percent tested, and built to the highest quality. Propelled by their reputation for quality of sound and design, they are constantly working on new products for new niches. The client needed a solution they could grow with, along with the ability to manage inventory on something better than spreadsheets. Their growth was strong, based on the quality and value of their products. As they grew, they understood they would need to invest in software to help manage their production, accounting, purchasing and sales. They considered a number of options, ultimately deciding to download and experiment with USA Odoo, a division of Open Source Integrators. They needed an Open ERP solution to avoid being stuck with a system that wasn’t supported if a company went out of business. They also wanted to have professional support available. After some substantial experimentation, the client reached out to Open Source Integrators for assistance with implementation of USA Odoo. Provide training and education to help the client’s team gain confidence and knowledge in their system. Implement the accounting module first, followed by manufacturing and warehouse, creating situational awareness while providing accurate accounting reports right away. Build self-sufficiency in the operation of the system. Gain efficiencies in purchasing and inventory. Offer integrated e-commerce, streamlining the sales process. OSI and the client embarked immediately to implement USA Odoo. The system was self-hosted on a cloud-based server, where vetted staff had access to the system through secure means. This system proved to be reliable, with uptime reported over 99 percent. After this hosted hardware was operational, the client worked with Open Source Integrators to configure financial accounting. The team had to work through a moderately complex data conversion of the previous system in order to ensure that the transactions were represented in USA Odoo correctly. Once the financial accounting framework was in place, the team implemented warehouse and manufacturing. This step required significant planning due to multiple warehouse and manufacturing locations, and a sophisticated approach to product fabrication. The client’s implementation used USA Odoo largely out of the box, but with some specialized modules to support their business model. They needed to look hard at business processes and adapt a few to USA Odoo’s approach, as well as customize the system in a few places as well. As an example, the client is using the USA Odoo e-commerce tools as a distributor-only sales channel. This system allows real-time ordering from larger, sometimes international, distributors, and gives the client real-time visibility into larger sales opportunities and helps them adjust manufacturing to meet these needs. Given the high value placed on their products by the users, they also needed a specialized approach to return management and replacement. Open Source Integrators built a specialized module to support this workflow, and ensure correct inventory and efficient returns. Upon successful completion of this implementation, the client is back to focusing on their real love – product innovation and engineering. The client worked closely with OSI to achieve internal solutions, supporting their position as the market leader in music effects. 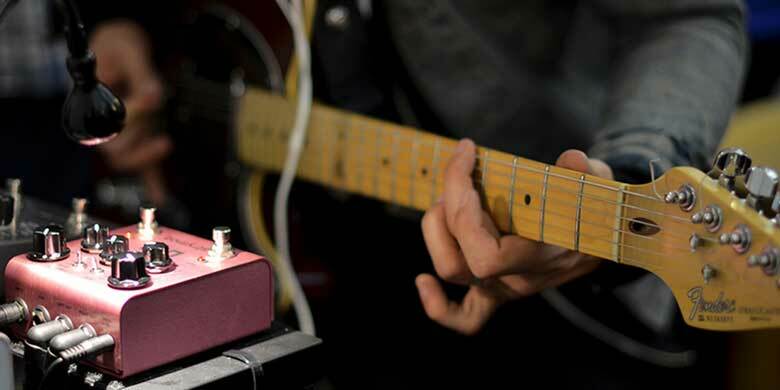 The client’s award-winning products stand alone as the best guitar pedals in the industry. They build to the quality possible, and deliver innovation that delights their customers worldwide. Open Source Integrators is proud to help enable their mission. They have gained a lot of efficiency, have a lot of confidence in their abilities, and have improved processes in key areas.